What is “Orally disintegrating tablets (ODTs)”? which are designed to be dissolved on the tongue rather than swallowed whole. It defined as tablet which disintegrates in the mouth within 30 seconds and can betaken without water. ODTs have attracted attention as an advanced dosage form which is better than conventional capsules and tablets for patient compliance and adherence. - Can be taken without water. - Can be taken any time or place. - Reduced the risk of aspiration. - Serve as an alternative dosage form for who have difficulty in swallowing or small children and elderly. - Decrease caregiver’s burden in the case of the patient who reject the drugs due to a psychiatric disease. -Withstand the shock during distribution; ODTs have to be hard approx. 60N. -Tablet friability should be low. -Tablets should be disintegrated within 30 seconds without water. -Most ODTs formulators try to make their ODTs disintegrate within 20 seconds. 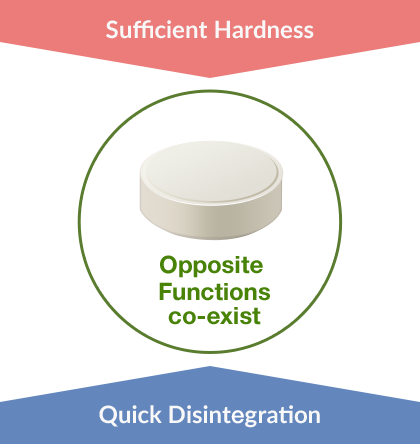 To design ODTs, it has to co-exist the opposite functions in one tablet. Previously, various materials and techniques have been developed to achieve ODTs such as lyophilization. However, ODTs can also be produced using the direct compression method with conventional equipment and a simple process. With co-processed excipient: GRANFILLER-D, you can produce ODTs not only easily but also with higher-quality.